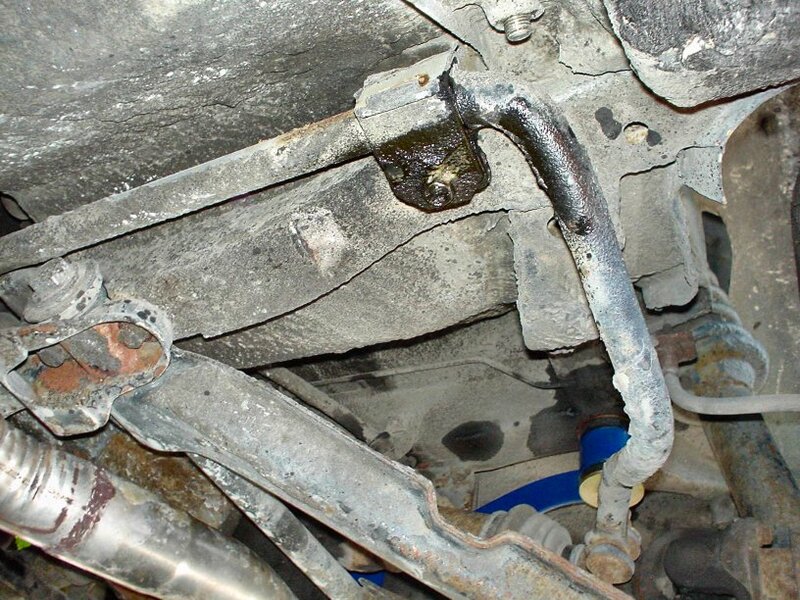 Here is the 1-1/8" front sway bar. It is much bigger than the stock one. More importantly, it works better. 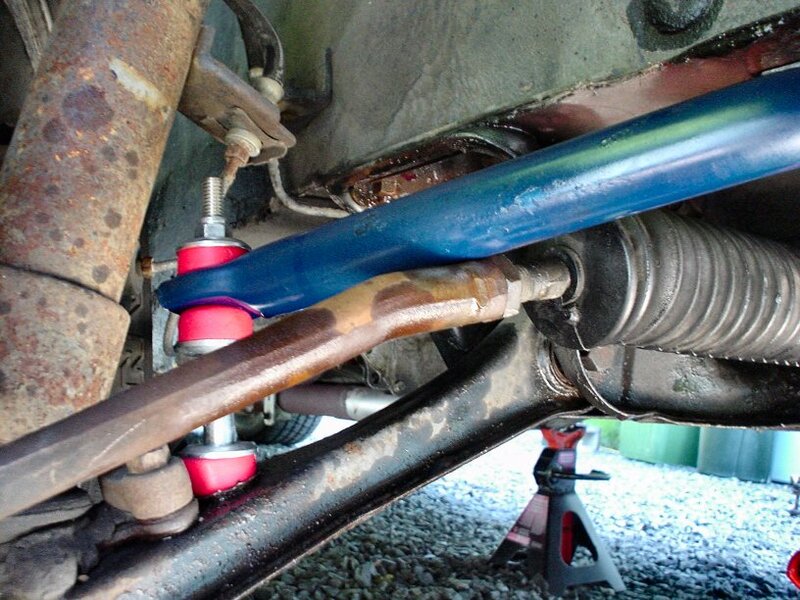 Changing the front sway bar is one of the most noticeable improvements you can make to the suspension. 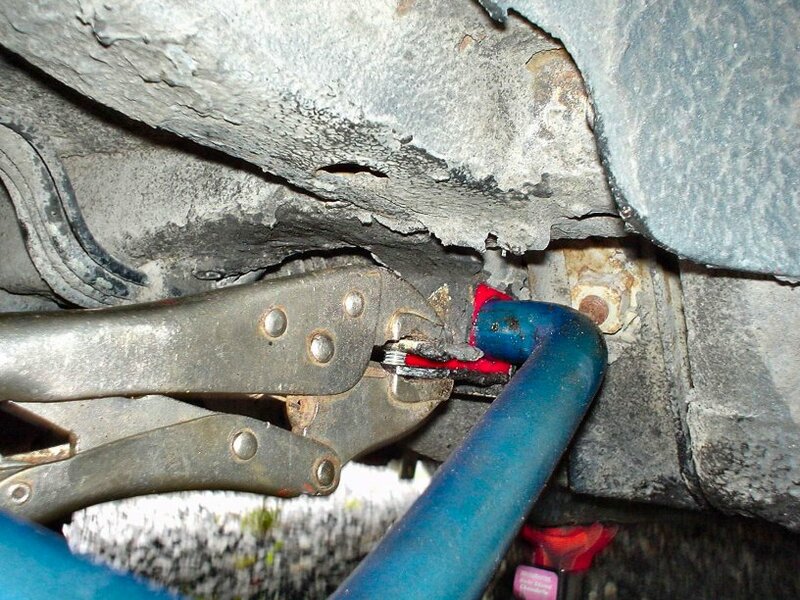 To remove the sway bar, simply disassemble both end links at the control arms then unbolt the U clamps at the frame bushing mounting points... easy. 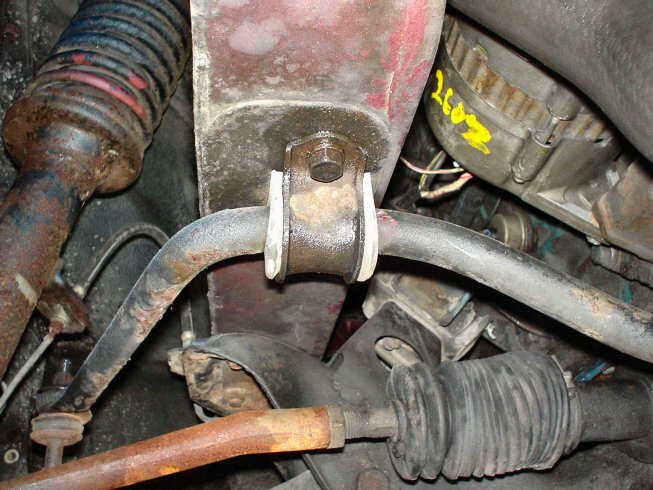 The center spacer in the new end link is too short and causes the sway bar to hit the tie rod at extreme turning points. The original end links threaded rods were very soft and easy to bend. Rust was hiding under this plate. Yup, the metal was very fatigued and bent when removing. 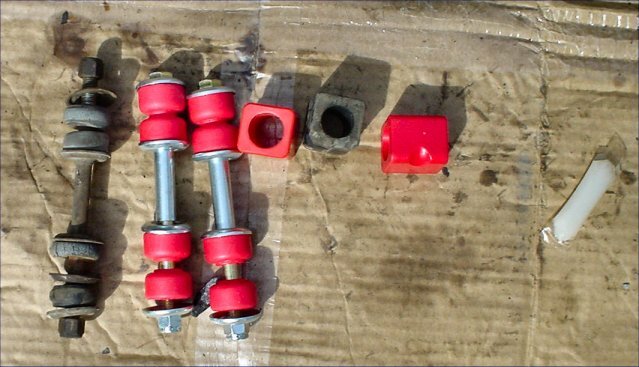 The tired bushings also were worse for wear and tear. 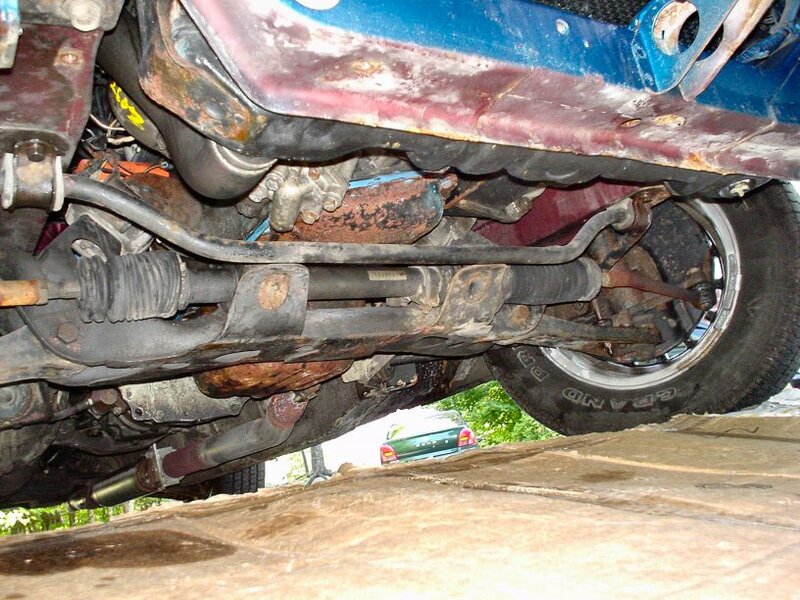 Note, the dip in the bar is on the lower side, and the split in the new bushing is oriented towards the rear of the car. 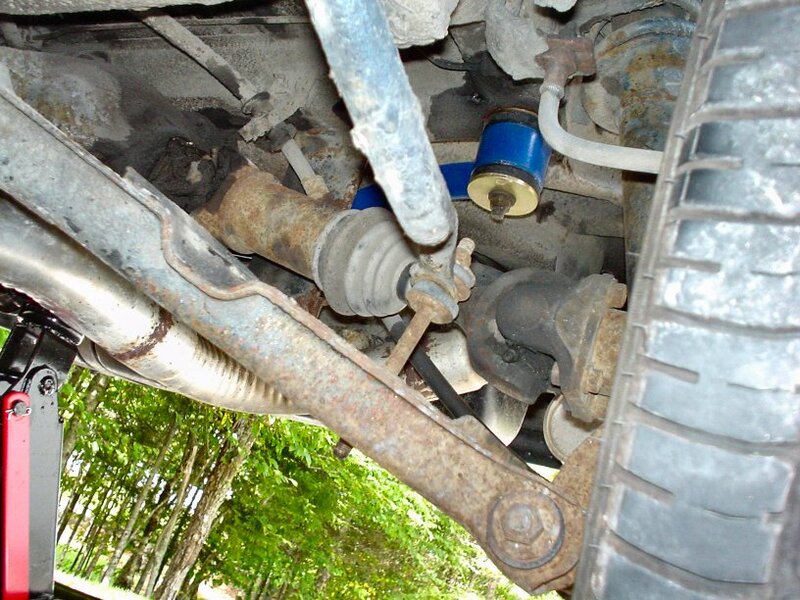 Once the new frame bushing plates are bolted in place (loosely), connect the sway bar (loosely) . Next, install the end links (loosely). 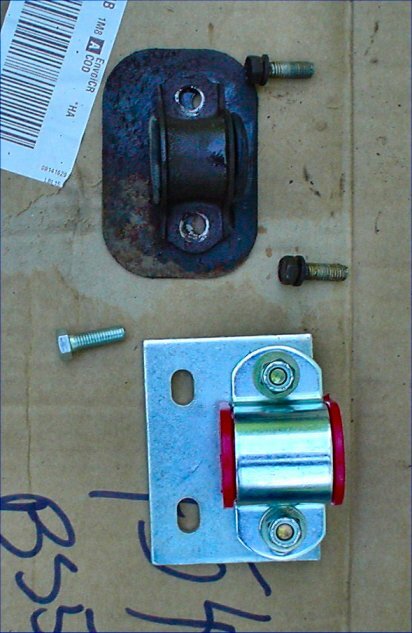 The bolt head is on the bottom and the captive nut is on the top. There is a cup built into the control arm. 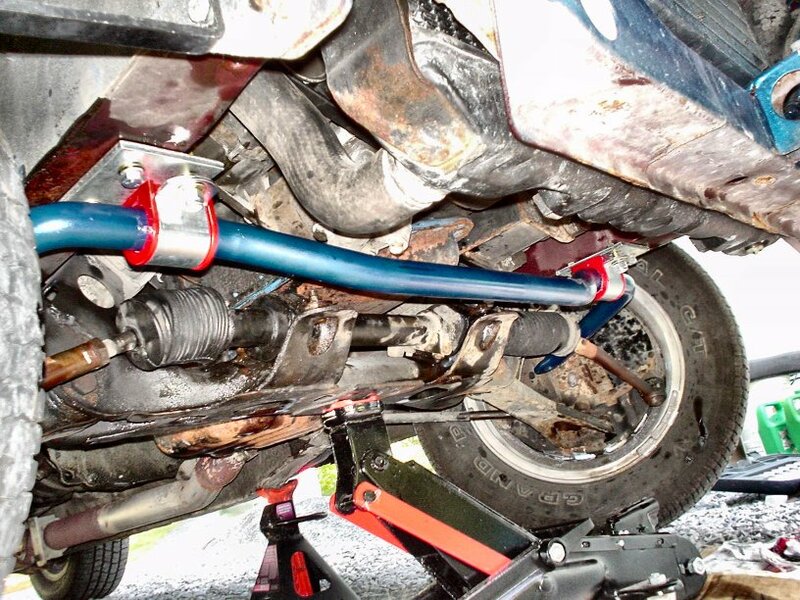 center the front sway bar with respect to the frame mounts (the distance from bar-end to frame rail should be equal on both sides). align bushing frame plates parallel to frame. tighten frame plates and U clamps. 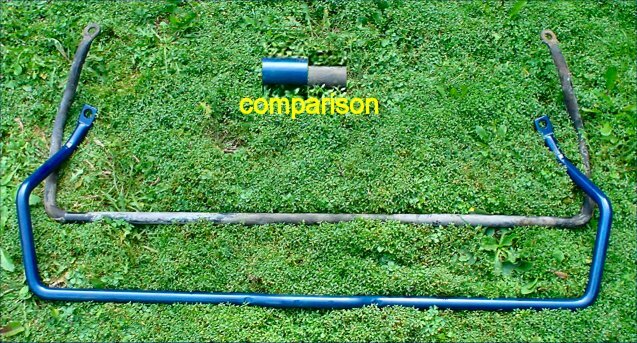 The 7/8" rear sway bar is bigger.... but it is more difficult to install and has less noticeable effect when driving compared to the front sway bar. 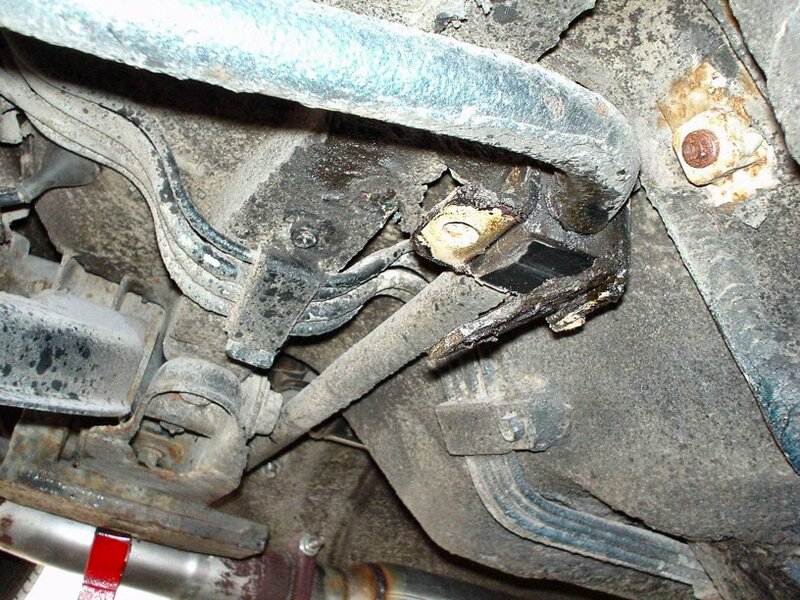 Here is a view of the rear sway bars end link. Here is a view of the frame bushing. It is coated with anti-seize (and some kind of rubberized under coating). Wire brushing the nut helps in disassembly. 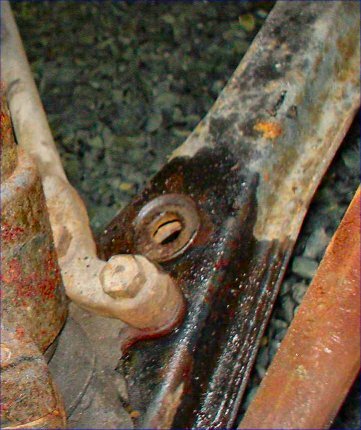 A view of a the lower end link to rear control arm connection. It is coated with anti-seize and is ready for removal. 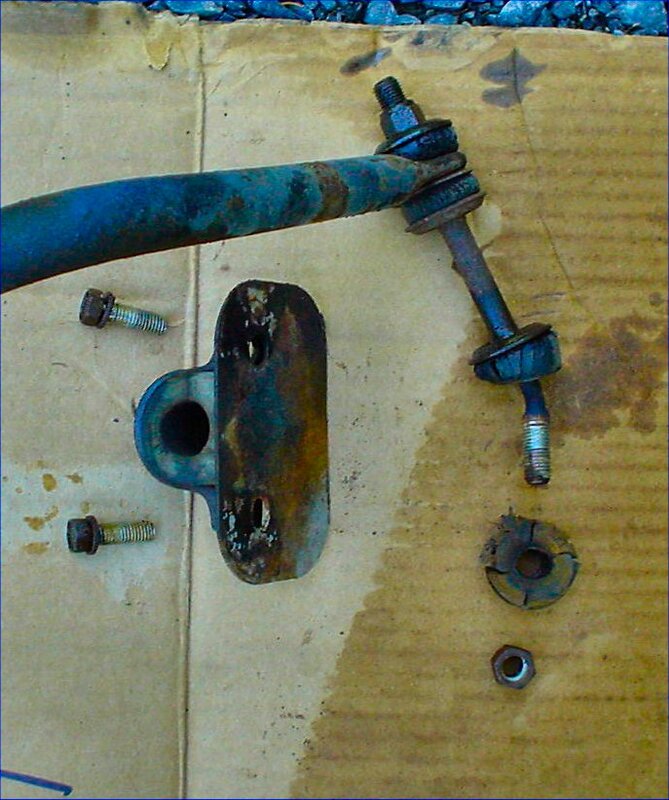 Once the end links are removed, the frame bushings can be removed. Their lower plate has a tab on the front and a bolt hole on the back. The plate functions as a lever that sandwiches the bushing and bar in place. Old vs. New. Note the notch in the red frame bushing. There is a corresponding "bump" in the frame mount. Important: When installing the frame bushing with the notch up and forward, there are actually two possible orientations which are different. 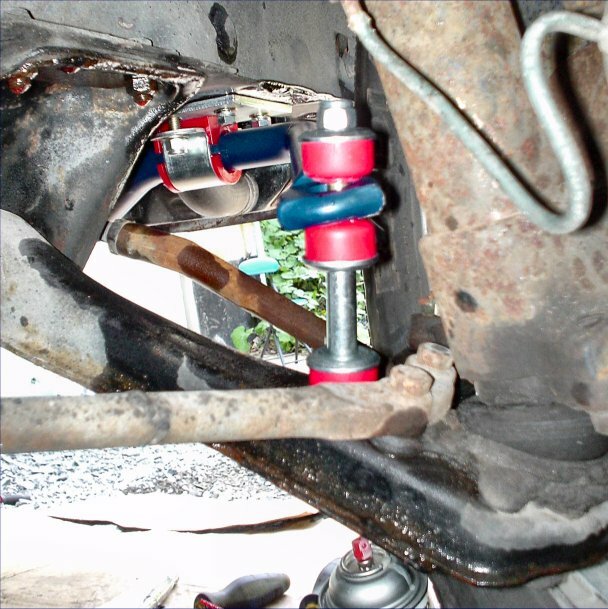 The easiest way to get the orientation is to install the bushing with the slit towards the rear of the car. (as best as possible) and lift the bolt side up. quickly get a vice grip in place and squeeze the assembly while trying to prevent the bushing from squishing out (may have to poke it in place). Next, install the end links. The flat side of the bushing is pressed into each cup. Grease every thing! (bushings, cups, bolts, nuts). 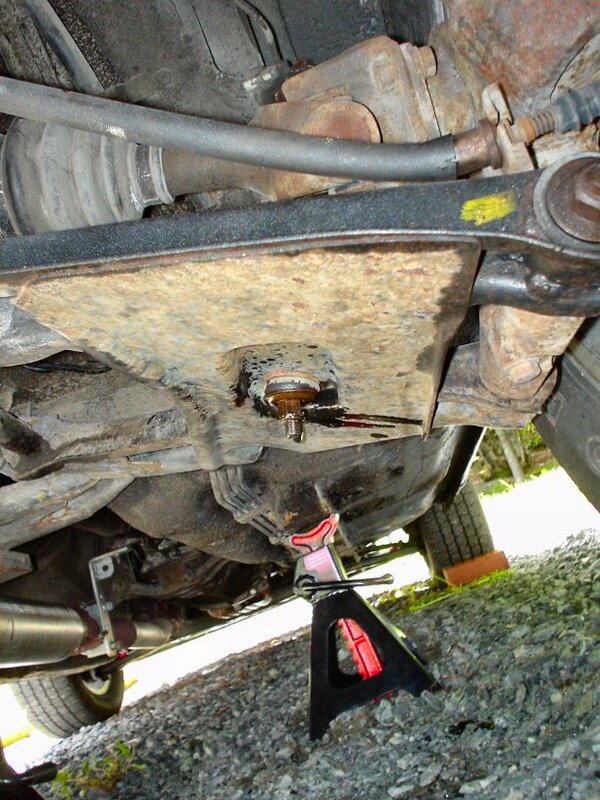 center the sway bar so that the space between the frame bushings and sway bar bend is identical on each side.